By 2012, every electricity consumer of the three big utilities in California will have smart meters which will give consumers detailed information about how they use energy and will enable new technologies automating customers’ responses. People are often confused by the terms “Smart Grid” and “Smart Meters.” Metering is just one of dozens of possible applications that constitute the Smart Grid. The idea of two way communications from suppliers to consumers to of energy is not new, and systems for commercial and industrial customers have been implemented using analog technology for many years. In recent years digital communications have become cheap enough for wider deployment. Advanced Metering Infrastructure (AMI) systems are the primary means for utilities to interact with their meters at customer sites. In addition to basic meter reading, AMI systems provide two-way communications that can be used by many functions and, as authorized, by third parties to exchange information with customer devices and systems. The number of smart electricity meters with two-way communications is increasing rapdily. A 2009 study by Research company Park Associates found that there are 8 million smart meters installed in the U.S, about 6 percent of all meters. The eMeter Smart Grid Watch blog tracks the progress of smart meter installations around the world. In May 2011, total U.S. smart meter installations passed the 20-million meter mark. There are commitments in place to install nearly 50 million smart meters by 2015. The ARRA grants allow recipients to recover up to 50 percent of the eligible project costs and are designed to accelerate the commercial use and implementation of AMI technologies. The ARRA AMI grants support projects with a total value of $2 billion in 29 states. The projects are focused on providing AMI to retail consumers and, in some cases, information and pricing mechanisms that will allow consumers to reduce their energy use and costs, and improve the reliability of systems. The DOE also awarded $2.1 billion of funding under the ARRA Integrated and/or Crosscutting Systems Grant Program to support 39 demonstration projects that focus on adding intelligence and integrating smart grid and AMI capabilities in specific utility transmission and distribution systems throughout the United States. These system-based projects are valued in excess of $4.9 billion and are located in 31 jurisdictions. The projects include activities such as installing open, interoperable, two-way communications networks, deploying smart meters for customers, developing demand response and price responsive demand programs, automating advanced distribution and transmission applications, developing "self-healing" and power restoring properties on the grid, developing improved pricing programs, and supporting the deployment of plug-in electric vehicles. In addition, the DOE awarded grants supporting 16 regional demonstration projects that include smart meters in nine states. These large demonstration projects are designed to provide industry with business models, data to assess technical capabilities, and actual cost and benefit information associated with integrating these systems and components on a network level. energy accounting for both forward and reverse flows. Quadrant II = reactive energy is positive and the other energy flows negatively. Quadrant III = reactive energy flows negatively as does the other energy (both energies are received from the service). MDMS – Meter Data Management System - Performs long term data storage and management for the vast quantities of data that are now being delivered by smart metering systems. This data consists primarily of usage data and events that are imported from the head end servers that manage the data collection. An MDM system will typically import the data, then validate, cleanse and process it before making it available for billing and analysis. The more flexible the MDM application, the better it is able to integrate to existing enterprise applications and help to streamline utility business processes. Benefits can be seen in billing, customer service, outage management and analysis of utility operations. Smart meters can collect customer readings as often as every 15 minutes, rather than every month, so utilities need new software to cope with all the extra data. Smart Grid - A form of electricity network using digital technology. A smart grid delivers electricity from suppliers to consumers using two-way digital communications to support energy consumption efficiency, real time management of power flows and to provide the bi-directional metering needed to compensate local producers of power. The "Smart Grid" is envisioned to overlay the ordinary electrical grid with an information network. Smart meters may be part of a smart grid, but alone do not constitute a smart grid. There is some debate as to whether smart meters are actually needed for smart grids. Smart Meter - Usually an electrical meter that records consumption of electric energy in intervals of an hour or less and communicates that information at least daily back to the utility for monitoring and billing purposes. Smart Meters provides higher granularity of meter interval data. Also, voltage levels, and power events can be tracked and logged across the entire customer base. Smart meters establish a two-way data connection between the customer and the power company, by sending information over a communications network that may include power-line, radio or cellular-network connections. Once smart meters are installed, power companies can determine the location of outages more easily, and no longer need to send staff to read meters, or to turn the power on or off at a particular property. Transforming today’s “dumb” electric meter into a smart consumer portal that allows price signals, decisions, communications and network intelligence to flow back and forth through the two-way energy/information portal is a key to achieving consumer control of electricity costs and consumption. Advanced devices such as two-way communicating meters, communicating thermostats, and home automation devices such as programmable and communicating outlet controllers will assist energy customers in managing their demand for energy. Wireless Star - Wireless star technologies are available in both licensed (200 MHz, 900MHz) and unlicensed spectra (900 MHz, 2.4GHz). Advantages of licensed technology include greater allowable transmission power (2 Watts vs. 1 Watt) and blocking of interference sources. The principal disadvantage is the need to obtain a jurisdiction-by-jurisdiction license to operate. The desired frequency may also have been already allocated. Advantages of unlicensed technology are elimination of licensing requirements due to the use of the “free” spectra and more choices in which set of frequencies to use within the spectral bands. These two aspects often offset the potential interference and lower allowable transmission power. Wireless Mesh – A communications network made up of radio nodes organized in a mesh topology. Wireless mesh networks often consist of mesh clients, mesh routers and gateways. A mesh network is reliable and offers redundancy. When one node can no longer operate, the rest of the nodes can still communicate with each other, directly or through one or more intermediate nodes. PLC - Power Line Carrier - the principal hurdle is propagation of the signal across power system equipment such as transformers. Transformers act as natural filters to the radio frequency signal. Another difficulty is maximizing the bi-directional communication rate. Fiber Optics. It is often difficult to justify “fiber to the home” for a single purpose use, such as advanced metering. Smaller utilities, including municipalities, have successfully invested in fiber optics as they can then offer cable television, phone service, and internet service first with enough bandwidth available for their utility operations. Remote Configuration - Diagnostics, software and firmware changes including: upgradeable WAN/HAN communications, leveraged open architecture principles in system design and future customer service offerings. In other words the thing will work like a Sky or TiVo set-top box, under the control of its master authority outside the home. Improve Reliability – Remote diagnostics can detect a service outage. Today, a utility may not know about an outage until the customer calls to complain. Similarly, they may not know when service is restored. Remote Cut Off - The ability for energy firms to cut off supplies remotely. Gas meters would probably include a remotely-operable shutoff valve for this purpose. Enables Real Time Visibility - Home-network abilities, allowing an in-home meter display and possibly the ability to watch one's meter reading on other devices such as computers, TVs etc. Requisite for Distributed Generation - Intelligent net metering , the ability to measure "exported" electricity, as when a house sells electricity back to the grid - perhaps from a plugged-in electric car or other storage system. Similarly the meter must be able to work with micro-generation equipment so as to let people sell electricity to the grid. Enables Conservation through ADR (Auto Demand Response) - The "ability to remotely [i.e. from outside the premises] control electricity load for more sophisticated control of devices in the home". AMI can lower electricity costs to consumers from flatter load curves that result from smart meter applications and changes in consumer behavior in response to tariffs that provide incentive to use less electricity during peak hours, but more than just installing smart meters is required to achieve this benefit. Improved Billing - Billing can be based on near real time consumption rather than on estimates based on previous or predicted consumption. This timely information coupled with analysis, can help both Utility providers and customers better control the use and production of electric energy, gas usage, or water consumption. AMI can change the maximum amount of electricity that a customer can demand at any time; and remotely change the meter's billing plan from credit to prepay as well as from flat-rate to multi-tariff. Theft Prevention- Smart meters can detect the unauthorized use of electricity and help to curtail the theft of electricity. Operational Efficiencies - Including; field communication links to distribution, revenue cycle improvements, situational data in near real-time, and wholesale - retail markets integration. Consumer Backlash - In this video, from January 2011, members of West Marin Citizens Against Smart Meters literally block the road to the small town of Inverness to prevent contractors from installing smart meters in homes there. This 2010 KCBS video reports on how some homeowners in Oakland's Manzanita neighborhood are putting Pacific Gas & Electric on notice: "Keep those Smart Meters away." This anti-Smart Meter you tube video has already gained almost 300,000 views. RF Health Problems have not been scientifically substantiated, but many consumers are very worried. 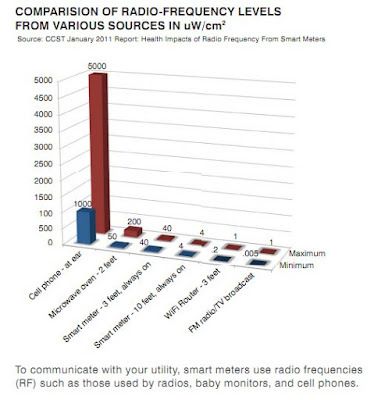 Smart meters pose a much lower danger than other RF sources in our environment such as cell phone towers. While many think fears of RF are silly, there have been other cases where a technology previously seen as safe turned out not to be. AB 37 Huffman. Smart grid deployment: smart meters. As of May 2011, in committee in the California Assembly. This bill would require the CPUC, by January 1, 2012, to identify alternative options for customers of electrical corporations that decline the installation of wireless advanced metering infrastructure devices, commonly referred to as smart meters, as part of an approved smart grid deployment plan. The bill would also require the CPUC, when it has identified those alternative options, to require each electrical corporation to permit a customer to decline the installation of an advanced metering infrastructure device and make the alternative options available to that customer. Vendor Lock In - Although many communications systems talk Internet Protocol (IP), they do so over proprietary hardware. Utilities did not insist on plug-and-play compatibility at the hardware level. their failure to take a standardized approach has cost them dearly. And will continue to do so for many years. Overspending - In America, typical prices are $110 to $120 per meter and about $50 for the communications. . California’s investor-owned utilities alone are spending about $4.5 billion on deploying smart meters over the next few years. That implies that a nationwide implementation could cost around $50 billion. But PNNL estimates that $450 billion would have to be poured into conventional grid infrastructure to meet America’s expected growth over the next decade anyway. In contrast, the typical cost in Europe is $40 per meter (plus $15 for the communications by the way). To make the math easier, let's say American utilities will install 50 million smart meters over five years and they will spend $40 more than the Europeans., that comes out to $2 billion. All of them must eventually be eMeters with the ability to communicate via TCP/IP over any available public or private network. Utilities that put in yesterday's AMR/AMI technology today will be severely disadvantaged. Market Access - Degree of Utility Control in Home - A 2006 survey of utility executive by GF Energy showed that nearly 90% if the executive believe that it is the utility companies that will be introducing end user electricity controls rather than independent entrepreneurs. 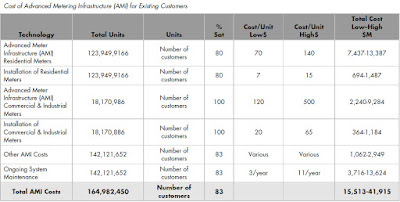 Regional Customization - AMI billing techniques and the machines themselves may require regional customization reducing potential economies of scale in production and deployment. Regional customization may be required because of differences in consumer preferences, aggressiveness of service providers, state and local regulations, and the speed with which smart grid structures and technology change over time. Not all regions are likely to respond identically and may have different needs. 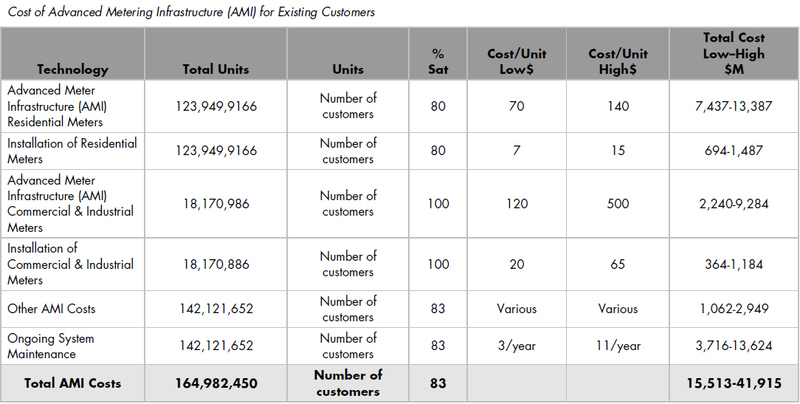 More Smart Meters - IDC counts roughly 230 AMI projects underway or scheduled in North America. When they are all completed in 2015, they will account for 50% of the total addressable market. The other half of the market will be the beneficiaries of better standards, lower prices and lessons learned. HAN Communication - Virtually all smart meters being installed in the US come with a second built-in radio — the Home Area Network interface — that can send information to one or more devices in the home. This is separate from the other radio in the meter that sends data back to the utility. A device in the home starts sending messages to the meter requesting data. In either case, the utility must enable HAN communication by authorizing a password between the HAN in-home device and the meter. This is very much like a password protection for a home wi-fi router, except that the utility controls this password (not the homeowner). Plug & Play - Whichever company or partnership asserts a true plug-and-play standard has a gigantic opportunity. The Itron/Cisco partnership is currently best positioned to break the proprietary stranglehold. Meter Upgradeability - In 2007, Congress declared in the Energy Independence Act (EISA) that modernizing the grid is national policy. EISA requires the National Institute of Standards and Technology (NIST) to develop a consensus on the standards and protocols necessary to ensure Smart Grid functionality and interoperability (See My blog article Standards Development Process for details). In 2009, NIST created the Smart Grid Interoperability Panel (SGIP), a group of public and private organizations, to coordinate the development of consensus-based Smart Grid standards. In April 2011, the governing board of SGIP voted in favor of a new standard and a set of guidelines important for making the long-planned “smart” electricity grid a reality. The documents address the need for wireless communications among grid-connected devices as well as the ability to upgrade household electricity meters as the Smart Grid evolve. The standards and guidelines resulting from PAP 0 (Meter Upgradability Standard) and PAP 2 (Wireless Communications for the Smart Grid) are crucial to ensuring that metering devices can be upgraded remotely and reliably, and that the sort of fast, efficient wireless communications typical today with cell phones becomes a part of the future electricity grid. Almost every house has an electricity meter, and the PAP 0 standard is designed to ensure that the new generation of smart electricity meters does not quickly become obsolete. Developing Opt Out Policies - Whether or not consumer fears of RF radiation are based on science, utilities need to respond to their customers. For example, Pacific Gas & Electric will disable smart meters for customers concerned about health and safety hazards from meter radio wave emissions, but the utility's March 2011 proposal to the California PUC also included a kicker those customers probably won't like. The utility wants to charge an upfront fee plus an additional monthly charge or rate increase to cover the cost of turning off meter communications radios, manual meter readings and the additional cost to "strengthen" its SmartMeter network. The CPUC told PG&E earlier in March that it had two weeks to provide an opt-out plan because of the continuing backlash and controversy over the new meters. While the commission at the time said it had seen no evidence that the meters' radio emissions were dangerous, it did want customers to have a choice, according to a news story in the Santa Rosa Press Democrat. PG&E spokesman Jeff Smith told the newspaper, "For customers who want it, we will turn off the communications radio and that removes them from the grid. 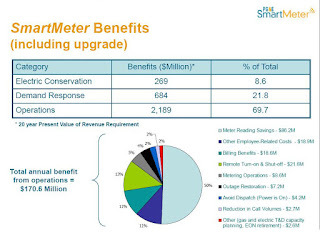 The ongoing fees cover the costs, primarily the labor but also the cost to strengthen the SmartMeter network." The fee plus monthly charge options offered by PG&E include either an upfront fee of $270 and a $14 monthly charge or rate increase or an upfront fee of $135 and a $20 monthly fee or rate increase. All the smart meter and AMI vendors are faced with some daunting challenges. The U.S. AMI market is currently in full deployment mode, initiated by regulatory mandates in Texas, California, Pennsylvania, and elsewhere, and fueled by $3.5 billion in stimulus funding. This party will subside in the not-too-distant future, as smart meters approach their terminal penetration rate of the overall electric meter installed base, which in itself is not growing much. Continued growth will require diversification in target markets (i.e. beyond electric AMI), products (software and services), and/or geography (i.e. Europe, Latin America, Asia). Aclara has mesh RF for urban areas and can reach rural areas with its low-bandwidth powerline technology (the legacy TWACS system). It is finally beginning to merge the two systems. If it gets its unification act together, it could offer utilities a low-cost transitional system. Aclara could sell a combination of mesh and powerline for now, as long as it could promise a seamless transition to WiMAX or LTE or another high-bandwidth, long-distance technology at some point in the future. Echelon, San Jose, CA - (NASDAQ: ELON) - Develops, markets, and sells energy control networking solutions primarily in the Americas, Europe, the Middle East, Africa, and the Asia Pacific/Japan. Its solutions enable everyday devices, such as air conditioners, appliances, electricity meters, light switches, thermostats, and valves to be inter-connected. Its networked energy services (NES) system comprises smart meters and other smart devices; edge control node and data concentrators; the NES networking operating system software; and the infrastructure and support required to implement and deploy network solutions. A heavyweight in Europe, Echelon has begun making inroads in the U.S. The company takes a different approach to the hardware than most others, designing more functionality into the meter’s “motherboard” instead of employing add-on modules. Its communications strategy draws on its European heritage. Rather than using RF or cellular to communicate with every smart meter, Echelon uses “distribution line carrier,” a more advanced form of old-school power line carrier. (See my blog article Broadband Powerline Communication) The power line relays information from each home to the transformer, which then uses any of the popular communications pipes to backhaul the data to the control center. They save the cost of putting a radio into every smart meter and the cost of troubleshooting meters that can’t communicate because of difficult reception. According to Pike Research’s market share analysis, Elster was the sixth biggest smart meter manufacturer in 3rd Qtr 2010 holding a 3% share of the market. Elster - Essen, Germany - (NYSE: ELT) - Elster Solutions, Raliegh, NC – Has delivered over 2 million smart metering devices worldwide with systems located in North America, Europe, Central America, Australia, New Zealand and the Caribbean. Elster smart metering system solutions provide utilities with energy conservation capabilities via demand response programs, smart grid applications, and operational efficiencies resulting in significant value creation across the utility enterprise. Elster sees itself as a solution provider, not a product company. Within the next five years they want to be working with utility partners on everything – from testing to going to regulatory commission meetings. According to Pike Research’s market share analysis, Elster was the fifth biggest smart meter manufacturer in 3rd Qtr 2010 holding a 5% share of the market. GE Energy. Atlanta, GA - (NYSE: GE) - Provides a full line of single phase and poly-phase meters to meet utility requirements for form factors and functionality. Meters come equipped with various options for communications technology, home area network options, remote service switch, as well as a number of embedded features such as load profile, demand, and TOU tariff. According to Pike Research’s market share analysis, GE was the fourth biggest smart meter manufacturer in 3rd Qtr 2010 holding a 20% share of the market. Itron, Liberty Lake WA - (NasdaqGS: ITRI ) Leading provider of solid-state meters—electricity, water, gas and heat—and data collection/communication systems, including automated meter reading (AMR) and advanced metering infrastructure (AMI) technology. Itron offers enterprise-wide software platforms, project management, installation and consulting services. Itron was the clear leader in first-generation AMR initially based on propitiatory standards, and the early leader in next-generation AMI contract wins. Given that nearly 8,000 utilities around the world already rely on Itron technology, the company has a large installed base from which to draw. Itron, leveraging its existing Automated Meter Reading (AMR) dominance, established an early AMI lead with its OpenWay system, but was especially hurt by the strength of Silver Spring Networks’ IP story. This was the catalyst for the Itron/Cisco partnership that may yet position Itron to ultimately “out IP” Silver Spring. In September 2010, Itron and Cisco announced a strategic alliance that will advance the transformation of the world's energy infrastructure. Together, the two will deliver a definitive 21st century Internet Protocol (IP)-based communications platform to the smart grid market and help advance more consistent and reliable delivery of energy across the electric distribution system and into homes and businesses. Under terms of the agreement, Itron and Cisco will jointly develop the reference design that defines a standard for smart grid field area and smart metering network communications, utilizing the latest version of the Internet Protocol (IPv6). A key standard identified by the National Institute of Technology, IPv6 integrates network security into its framework; allows for simplified processing of data by routers and other network devices; and offers a wealth of extensibility options over the current and widely-used IPv4 implementation. According to Pike Research’s market share analysis, Itron was the second biggest smart meter manufacturer in 3rd Qtr 2010 holding a 24% share of the market. Landis + Gyr, Zug, Switzerland - Although the metering company can trace its roots back to 1896 in Switzerland, it became a conglomerate of networking and metering companies consolidated by Australian private equity firm Bayard Capital in 2008. Worldwide leader in electricity metering with a preeminent position in advanced or “smart metering" systems. Privately held with US$1,364 million sales in 2008. Over 5,000 employees, 600 full-time professionals dedicated to R&D, and operations in 30 countries across five continents. Landis+Gyr earned about $200 million on about $1.5 billion in annual revenues in 2010, Reuters’ anonymous sources report. Sentec, Cambridge, England - Develops tailored smart metering solutions in partnership with metering and utility companies. With more than five million smart meters worldwide incorporating its smart sensor technology, Sentec combines technical expertise with an in-depth understanding of grid and metering infrastructure to deliver upgradeable metrology solutions. For years the company has been a behind-the-scenes partner to meter manufacturers such as Sensus. Now the company hopes to convince utilities to ignore those manufacturers and specify their own systems with Sentec as their consulting partner to spec the design and have it built via the company's network of contract manufacturers. Sentec alleges utilities can have the superior meters at little or no extra cost. For one thing, Sentec claims to be expert in designing ultra low-power, low-cost solid-state meters. Second, it works with contract manufacturers and takes advantage of their economies of scale. The Sentec formula is lots of flash memory, plus a more powerful processor, plus an operating system that would be the same from meter to meter. In theory, this means "apps" developed for one brand of meter would run on others, provided they used the Sentec operating system. Internally, Sentec calls its operating system for meters "Breeze," though it has not yet launched it formally to the outside world. If the idea catches on, the meter will evolve from a relatively dumb measurement device into a smart, sophisticated, upgradable platform for multiple applications – more like a home gateway. It is certainly true that meters should ideally be field upgradable. And capable of posting new applications as we dream them up. That need is being addressed to a limited extent by many of today's vendors. The Sentec approach would be like the move from "feature phones" to "smart phones" in the cellular world. Sensus, Raleigh, NC - Employs almost 4,000 people in 41 facilities on five coinents. A one hundred year old privately held company that issues publicly traded, SEC-registered bonds. Sensus is now running at more than $1 billion in annual sales, with more than 200 projects and 8 million smart meters in the field. Sells meters under the iCon brand, along with a growing range of hardware and software for distribution automation. But it is with its FlexNet communications network that the company truly sets itself apart. FlexNet has also been used with meters from GE, Landis + Gyr and Elster. In July 2011, Sensus announced that it will integrate encryption and key management technologies from IBM into its FlexNet™ advanced metering infrastructure, a step that Sensus says will not only enhance its existing security capabilities, but will also help advance data security as a critical element of the smart grid. Silver Spring Network - Redwood City CA - Makes the radio card and provides services to its customer utilities, but the meters themselves come from other manufacturers. SSN communications modules are compatible with most major meters, so utilities feel they are not locked in to any one meter manufacturer. But they are locked in to Silver Spring Networks. Sure, they can swap in a different meter. But they can't swap in a different communications module. Most of SSN's competitors use a similar strategy. Silver Spring Networks’ undisputed lead in U.S. utility AMI was built by its strong commitment to the IP communications protocol at a time when competitor’s products were universally proprietary. This success drove a dramatic change in the industry, where virtually all AMI vendors have now adopted the IP protocol in one way or another. This has not yet approached the goal of multi-vendor interoperability for smart meters, as key parts of even the Silver Spring Networks implementation, such as the “meshing” protocols, are “pre-standard” (i.e. proprietary). SSN has raised over $275 million from investors. Their rumored 2010 IPO did not take place and in July 2011 Silver Spring Networks filed an S-1 for its long anticipated IPO. Expected pricing for the IPO was not announced, but the $3 billion target valuation rumored at the beginning of 2010 would seem rich given the $2.3 billion price for the more diverse Landis+Gyr, and the current $1.8-2 billion valuations for Elster (who IPO’ed last fall) and for industry powerhouse Itron. Provides the hardware, software and services that allow utilities to deploy and run applications, including Smart Metering, Demand Response, Distribution Automation and Distributed Generation, over a single, unified network. Silver Spring's Smart Energy Network is based on open, Internet Protocol (IP) standards, allowing continuous, two-way communication between the utility and every device on the grid. SSN has successful deployments with leading utilities in the US and abroad, including Florida Power & Light, Pacific Gas & Electric, Pepco Holdings, Jemena and United Energy Distribution. SSN is the clear leader in RF mesh, which is the clear favorite with large, investor-owned utilities in the U.S. But some analysts believe public cellular networks could catch on, especially when 4G arrives. Meanwhile, parts of Europe seem set on powerline carrier and parts of Australia are using WiMax. If other transports catch on, SSN will have to be quick about supporting them. In home area networking, Silver Spring purchased Greenbox has a "technology alliance program" that includes many home energy-monitoring companies, including Tendril, Greenbox, Control4, Energate, Radio Thermostat and, most recently, Onzo. Trilliant - Redwood City, CA - Provides intelligent network solutions and software to utilities for advanced metering, demand response, and Smart Grid management. More than 20 years old, but reformed in 2004 to concentrate on the smart grid space. Trilliant has over 200 utility customers, including Hydro One in Ontario, Canada. Hydro One has deployed Trilliant smart communications to over 1.1 million customers in support of the largest operating time-of-use billing program in the world. Secured $40 million VC funding from MissionPoint Partners and Zouk Ventures in 2008 toward the development of intelligent networks powering smart grid related functions. In July 2010, closed financing totaling $106 million from a global syndicate of industry and financial leaders. The financing round was led by two highly-respected financial investors, Investor Growth Capital (the wholly-owned venture arm of Investor AB of Sweden) and VantagePoint Venture Partners and two leading global grid-related equipment companies, ABB and GE. Trilliant acquired SkyPilot in 2009. It has effectively merged its NAN-oriented RF mesh network with SkyPilot’s WAN-oriented WiMAX, and done so with multipurpose boxes that can handle both technologies. The company builds a "multi-tiered network" that uses a beefed-up version of the 802.15.4 wireless standard – which the ZigBee protocol uses for in-home equipment – as its primary home-to-utility concentrator point communications technology, according to Eric Miller, Trilliant's chief solutions officer. Using an altered version of the 802.15.4 wireless standard to allow meters to mesh with each other and with concentrator points. SecureMesh gives device vendors a standards-based way to rapidly deploy mesh technology in dense urban smart grid applications. Trilliant is one of the first AMI communications vendors to use a commodity IEEE 802.15.4 PHY and MAC layer for mesh purposes. Click here for Erich Gunther's analysis and scorecard of Trilliant's SecureMesh technology. An April 2011 report from IDC Energy Insights offers a detailed assessment and ranking for seven major vendors in the smart metering communication network market. FERC - Federal Energy Regulatory Commission. 2010 Assessment of Demand Response and Advanced Metering Staff Report. Nice to see this article , it’s so more informative Information. Thanks for sharing , And get more information best micro wire mesh manufacturers.